If you want a fast wagon in the United States, bless your heart. Americans love bloated crossovers and trucks, but never were deemed worthy of the subversive joy of a quick longroof. If you can’t wait for other countries’ leftovers to pass the 25-year import rule, never fear! You can make your own S4 Avant out of two Audis. The finished wagon, wearing wild phone-dial-style wheels. Avant, of course, is Audi-ese for “wagon,” and fast Avants are the stuff of legends for most of us in the United States. We may have lucked out and gotten the A3 with a cute little hatch for a while, but the true legends—from the RS2 Avant on up—have been kept just out of reach for North Americans, at least without knowing an importer and/or some potentially shady registration tactics. Many of us would rather have a U.S.-legal car than deal with the potential of getting a car seized and crushed, and that’s why Audi owner Chuck Sampson decided to take his wagon desires into his own hands. This all began when Sampson had a perfectly fine B8.5-generation 2014 Audi S4 sedan, which was nicely optioned and had been well taken care of by the Audi saleswoman who owned it before him. The S4 is powered by a supercharged 3.0-liter V6, which was rated for 333 horsepower when new according to Audi—a nice bump over the 211 hp produced by the standard A4's 2.0-liter turbocharged inline-four. To wit, a contemporary Motor Trend review of the car described this S4 engine’s 333 hp figure as “comically underrated.” It’s a gem. Sampson picked up the S4 after reading encouraging reports from owners who modified and tracked theirs with promisingly few issues, and falling “instantly in love” after a test drive. It also came with all-wheel drive and a seven-speed dual-clutch transmission, which suited his busy one-and-a-half-hour commute well. He added a few tasteful mods along the way, including an AWE track exhaust, AWE resonated downpipe, Vorsteiner VFF-102 wheels and an EPL Stage 2 tune. Chuck’s previous car was a Subaru Legacy 2.5GT Spec.B, which had an all-wheel-drive system he loved but also went through three engines before he got rid of it. He really wanted a wagon, though—so much so that he told Jalopnik via email that he would have swapped the sedan Legacy body for the longroof version if he had kept it. “I’ve always loved the wagon body style, ever since my first ride in a Volvo wagon, sitting in the rear-facing seats,” Sampson wrote on his Audizine build thread. A slower wagon, before the S4 swap. 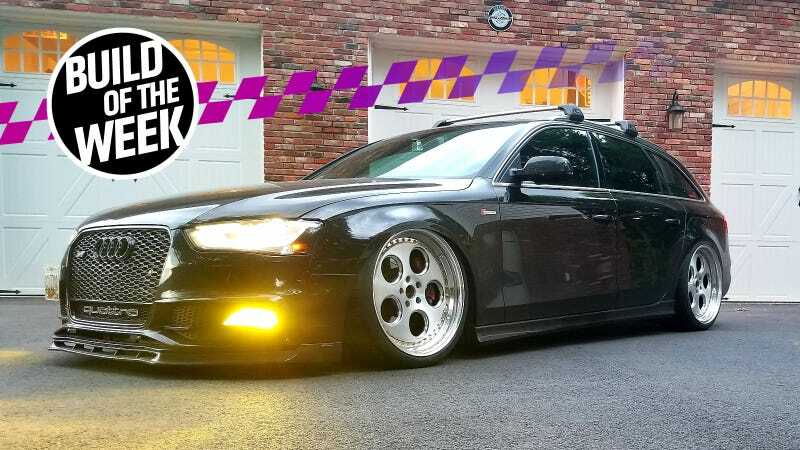 In doing the research for his new purchase, he also found GMG Racing’s incredible B8-generation A4 body-swap, where they swapped all the go-fast goods from a B8 S4 sedan into an B8 A4 Avant body. Their sedan body was repurposed for another race car project, but the rebuilt Avant was a thing of beauty: an S4 wagon that was legal in the United States, and even emissions-compliant in California. You can (and should) read up on that build here on Audizine. This bit of inspiration was all it took for Sampson to go wagon shopping. He enjoyed his immaculate S4 as-is for three years before finding just the right Audi wagon to use: a B8-gen 2011 A4 Avant. The A4 Avant was in decent shape, and Sampson drove it around for a month before digging into it. Sampson disassembled the Avant first, with the full knowledge that the body wiring harness was likely different from the A4 Avant to the S4 sedan. Sampson wanted to keep all the nice features he enjoyed in his S4, including the sport differential and adaptive headlights, and didn’t want to run into strange issues with incompatible components on down the line. So, when I say he disassembled the wagon, I mean all the way to a shell. First, the interior came out, revealing the metal underneath and all of the wiring that makes it work. Next up were the A4's engine and rear end. Putting the car up on his home hydraulic lift helped with this task somewhat, as the car could just lift up off of the components in question. Caster-wheeled dollies—the kind typically used to move a car around without needing to start it—slid right under each wheel just as if they were attached to a normal parked car, and rolled the A4 components away. One A4 Avant rear axle, all out. The A4's front axle, engine and transmission came out next. One bare A4 Avant shell, ready to go. Next, the S4 got disassembled in the exact same manner: all the way down to a bare shell. Sampson grouped parts in boxes roughly with nearby components from when they were taken out of the cars, and put smaller stuff into labeled baggies, which is always a mixed bag of its own—especially when you forget what your handwritten labels meant. The hardest part of the build, was doing it in my garage without proper tools like the hydraulic engine lifts they use at the dealerships. You can see, in my pictures, that I made do with a few butcher-block tables but it was still pretty interesting to get them lined up under the body since the tables didn’t have wheels and basically had to be dragged into position. One table helped move the S4's engine out of the way until it was needed. There are wheels there, but the engine and transmission certainly outweighed their capacity. German car tech has come a long way from the tiny aircooled Volkswagen engine blocks that even I can carry if I grunt really hard. The S4's engine and transmission needed that prized, hard-to-drag spot on the butcher-block table. Both engines came out with the transmission and cooling system still attached, in one big piece. The A4 Avant’s whole front axle came out along with the engine, suspension and all. With everything out and easy to see, Sampson noticed a few additional minor differences. For one, the A4 was a Premium Plus trim, and the S4 was a Prestige. The door handles had to be swapped between the two cars so that Sampson could retain the S4's keyless entry. Installing the S4's door cards in the Avant. Once he installed the keyless entry-equipped door handles and the red-and-black S4 interior door cards in the Avant, Sampson took a closer look at the two wiring harnesses to ensure both would match up. They didn’t. The 2011 A4 Avant was a regular B8, before the 2012 mid-cycle facelift that begat Sampson’s original 2014 B8.5 S4. Fortunately, the A4 Allroad was a longroof version of the B8.5 that was sold here. Sampson purchased a 2014 Allroad body wiring harness from a local junkyard, complete with the updated connectors and modules Sampson needed to make his S4 parts work. The only real difference between the S4 and A4 Allroad body wiring harnesses were for S4-specific components, so he stripped out the wiring for the sport differential and the soundaktor from the S4 harness, spliced them into the new A4 Allroad harness in the exact same location they were on the S4's harness, and hoped really, really hard that would all work when the car was back together. Yes, you read that right: He added back in the soundaktor. That’s the German word for “sound actuator.” This is the contentious part of the car that simulates engine noise in the S4's cabin. I realize that this particular part offends some automotive enthusiasts as an affront to the laws of physics and common sense. Even I have ranted against fake exhaust notes before on this very website. However, in the context of replicating the exact same driving experience he enjoyed in his original S4 sedan by taking minimal risks with reassembly, swapping over all the accessories the S4 had exactly as they were in the S4 sedan makes practical sense. Aside from the physical challenges of moving the heavier swapped components in and out of the car, Sampson told Jalopnik that figuring out what wiring made the sport differential work and splicing it over was the hardest part of this swap. The A4 Avant’s gas tank and evaporative canister also got swapped for S4 components, as the A4 had three lines that went up to the engine bay and a different evap plug, whereas the S4 only had two lines heading into the engine bay. This also let Sampson reuse the fresh fuel pump he just upgraded in the S4. Then came the relatively straightforward reassembly time. In went the power and ground for the S4's electric steering, the engine and the rear-end components, which included that prized sport differential. Next up was running the wiring for the rest of the car. Fun fact: only two plugs connect the engine and transmission wiring harness to the body wiring harness. Sampson powered through this swap in just around three weeks. Three weeks! That seems like a startlingly short amount of time to disassemble two cars and reassemble them into one, but working fast had a big advantage: Sampson remembered where most things went in the car during reassembly. If you’re going to take a while on a project like this, he recommends taking some photos to remember where things go. Redying the rear cargo cover to match the rest of the interior. Then it was time for the finishing touches. Sampson installed the S4 carpet and metal dead pedal first, followed by the S4 dashboard and seats. Meanwhile, the rear cargo area sunshade from the A4 Avant was redyed with synthetic dye, and plastic interior pieces were resprayed with black paint to match the newer black and red 2014-model interior. Likewise, the A4's headliner and pillars were wrapped in black suede. Chuck also installed a power liftgate system that wasn’t original to the 2011 A4 Avant. However, this was fairly easy to install as it was a feature on the 2014 A4 Allroad and the connectors for the liftgate motors were already there in the car’s new wiring harness. The lone problem with switching to black suede interior trim was that the rear of the car was pretty dark, so Sampson ran power from one of the side trunk lights to add two OEM-style LED lights in the roof panel to brighten things up. He liked the extra light from the LEDs enough to swap the other cargo-area lights for LED bulbs after the swap was complete. Chuck’s meticulous work paid off. The car started up on the first try with only a few fault codes that were easy to sort. There was a dynamic steering fault that was fixed with a fresh clock spring, which is a component that fits behind the steering wheel on the S4 steering column. He also got a sport differential “implausible signal” fault from reusing the A4's brake light switch. The part numbers for both cars’ brake light switches were the same, but conveniently, putting the S4's brake light switch in the Avant fixed the issue. Washing the car once it was finally back together. Ultimate humblebadge, anyone? A third fault didn’t trigger any dashboard lights, but related to the HVAC system’s humidity sensor. This piece is built in to the rain sensor on the B8.5 models, whereas it was a separate sensor on the pre-facelift B8. This was also easy to fix with a new sensor. After a few days of driving, he added some desired cosmetic tweaks: ECS fog surrounds, Audi Zubehör side skirts and a front lip. After it passed Maryland’s state inspection, he added a carbon fiber RS4 replica spoiler and a subwoofer. Carbon fiber RS4-style replica spoiler purchased from Aliexpress. The fully swapped S4 Avant. Later, Sampson added AccuAir air suspension to the car to drop it down low when parked, hiding the air tanks in the rear tire well and the controller for the system in the ashtray. The car still rides at its stock height for daily driving, but drops to an aggressive stance when Sampson wants to show it off. Air suspension tanks neatly tucked into the spare tire well. He also replaced the seatbelts with a red set to match the seats, and even figured out how to set the car’s infotainment system to display a wagon instead of a sedan. Sadly, this car’s story isn’t all added horsepower and rainbows. The S4 Avant was totaled by his insurance company after a crash in December. Sampson told Jalopnik that he plans buy it back and rebuild it however he can. He wanted to keep his future plans a secret for now, so I highly recommend watching his build threads on Audizine to see what happens next. So, there you have it: All you need to get the B8-era S4 Avant that we always deserved is an S4 sedan, an A4 Avant and, uh, we should probably also count the junkyard A4 Allroad that graciously sacrificed its main wiring harness for this project, too. It’s a lot of work, but 25 years is just too long to wait for good, fast wagons to come here the other way. One of Chuck’s helpers on this build helps remove the A4's rear axle assembly. The bare A4 Avant shell, waiting for the swap. Keyless entry door handles from the S4. Starting to add S4 components into the Avant body. One of the notes made when Sampson redyed the cargo cover. Repainting interior components to match. Power and ground wires for the S4's electric steering. Finally putting the S4 Avant together. Interior reassembly of the S4 Avant. Reupholstering interior pieces in black suede to match the S4's interior. Seats are in, along with the motors for the power liftgate system. First car wash after reassembly. New LEDs over the rear cargo area. The completed engine bay, with the car’s Eventuri red kevlar intake all shined up. The S4's badges eventually made their way onto the front.